Kane suffered suspected ankle ligament damage against Sunderland at the weekend. TOTTENHAM HOTSPUR BOSS Mauricio Pochettino is facing the prospect of losing star striker Harry Kane for the next two months due to an ankle injury. 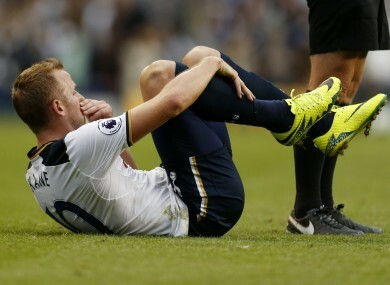 Kane was stretchered off against Sunderland on Sunday and Tottenham are waiting for final confirmation on the results of a scan, amid fears he could miss significant action in the coming weeks. An initial scan ruled out a fracture to Kane’s ankle, but the Daily Telegraph reports that Spurs are concerned the 23-year-old suffered grade two ligament damage, which would keep him sidelined for six to eight weeks. That would mean Spurs have to play their next three Champions League games and the North London derby against Arsenal on November 6 without their talisman. Kane also faces the prospect of missing out on England’s World Cup qualifiers against Malta and Slovenia in October. Email “Harry Kane faces two-month spell on the sidelines as Tottenham await scan results”. Feedback on “Harry Kane faces two-month spell on the sidelines as Tottenham await scan results”.